I sat at the Colfax train station for about 2 hours and some change pretty much not thinking about anything. Consider it a form of meditation. The bus depot faces a cliff face carved out of a foothill of the Sierras. The route opened in 1865 under the Central Pacific Railroad after years of digging trenches, tunnels and defying nature. Chinese, Irish, native and other cheap labor that were sent into tunnels, caves, mines and in danger's way for nothing more than a pittance (to be claimed at the company store); often their bodies broken or blown up along the way. Casualties of capitalism. I wondered how much TNT blasted through places like Colfax, CA and how many broken bodies laid down for us to have the privilege to use the right-of-way. Of course, I was taking the bus anyway. It was late because it was snowing in the Sierras. Later as we drove south down California state route 49 and joined I-80 west, little things that would pop up along the route that would grab my interest: look at that cute old Victorian off the road, the Foothills Bowl, little towns and farms. Further west, these holdouts from another time would be replaced by more and more modern detritus: the Save Mart, Jack in the Box, Walmart, "civilization." Soon I'd be in Sacramento and forced to choose bad or worse food - my connection now blown, my layover in Old Sac now a phantom quickly disappearing from sight. The Sacramento Station is the hub for some of Amtrak California's busiest spokes, serving the Placer/Sierra bus route I rode in on, the California Zephyr with service to Chicago, the Coast Starlight connecting Los Angeles and Seattle, the San Joaquin connecting Sacramento to Bakersfield and the Capitol Corridor route between the Bay Area and Auburn, California. It is the 2nd busiest hub in California and undergoing extensive renovations, so perhaps that's why there is only a small concession stand (and scattered vending machines) serving coffee and packaged prepared food to commuters. "If you want one of those healthy sandwiches there's a Starbucks at the end of the driveway," I overheard the concession lady tell a customer while standing in line. I promptly spun around to head out of the station toward Starbucks. Given the alternative, this is the lesser of evils. I wish I'd stayed another day in Grass Valley, where I had one of the best meals in recent memory. Kudos to the folks responsible for the decor of Grass Valley's Diego's Restaurant: red clay tiling in the Spanish colonial style, corrugated tin siding as separators, mismatched antique iron tables and chairs with embroidered padding, a hanging globe of dried peppers and potpourri and several large murals made of broken ceramics arranged in a mosaic (a nod to the Islamic influence on Spain during the middle ages). Diego's features Latin American food but it is clear that there is a strong Argentine accent, a curious cuisine I look forward to learning more about. Diego's menu features that South American countries peculiar blend of pre-Columbian and colonial cuisine (certainly an emphasis on beef, a nod to that country's gaucho heritage). Upon being seated we were greeted with a late of tiny, round soda breads with herbed butter and chimichurri. Our waiter introduced himself and took our appetizer order, excusing himself, "a 14-top of senior citizen hikers just sat down in the banquet room so I might not be back for a while, if you need anything feel free to grab the waitress." "Oh yeah, where were they hiking," I asked. "Not sure, they say they walk around the Sierra foothills all day long then they all come here to eat," said the waiter. "Ask them where the gold is buried!" asked Ted, Alice's beau. "I would but they'd probably start throwing food at me." Sounds like a rowdy bunch. This is how I envision my golden years. Our waiter, in full hipster regalia of skinny jeans, suspenders, ironic waxed mustache and Ben Hogan cap, retreated to the banquet room. Our appetizers and salads arrived soon later. We ordered empanaditas (small empanadas) filled with jack, mozzarella and feta served with guacamole and pico de gallo. I could tell the empanadas were of the South American style because the crust was a flaky laminated dough like those used in the Brazilian and Chilean varieties. I would have prefered more chimichurri! I overheard the hipster waiter explaining that empanada was from the Spanish meaning "in bread" (our word cell being "pan"). What he didn't explain was the Persian origins of the dish, the sanbosag, which spread through the Arab peninsula and made its way to Spain (as well as spreading to the East into India where it became the samosa). Salads were mesclun greens and vegetables served with a cilantro and lime vinaigrette. The most notable thing, aside from the delightful dressing, was the fact that the apples seemed to have been pickled. 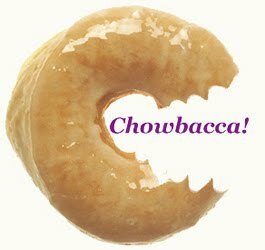 Once again, Chowbacca! is on the vanguard of yet another cool food trend. Our other appetizer was another cross-pollination of cultures: a stuffed jalepeño pepper. In the hands of smaller minds and lesser cooks, this easily becomes a modern joke-food, the "popper", something one might order in a "sushi" roll at Tex Wasabis or as a starter at TGI Friday's. "This is the original jalepeño popper," noted Ted. And how... pre-Columbian cultures would stuff peppers with grains, dried fruit and meat. The Spaniards brought their love of cheese (and the genes to tolerate lactose into adulthood) and hence the modern chiles rellenos. The Spaniards also brought with them the guitar (also borrowed from the Persians by way of Arab Muslims, the Moors). The Moors were expelled from Spain, allegedly, during Inquisition, but their influence remained. Speaking of guitars... as our hipster waiter came over to get our entrée orders, the soft generic Spanish guitar that had been playing switched over to the Rodrigo y Gabriela cover of Metallica's Orion, prompting me to throw up the devil's horns and exclaim "yeah! Metallica!" I'm not talking about that weak post-Cliff Burton Metallica but real Master of Puppets Metallica, complete with an extended bass solo (which Rodrigo y Gabriela faithfully reproduce). "The specials tonight are..." I tuned out somewhat until I heard about the New York strip served with garlic mashed potatoes and vegetables a la plancha. What the waiter said next erased any inclination I had toward ordering the steak, however. "Finally we have a house specialty called a panqueque with braised beef short ribs. It's an Argentinian crêpe that's filled with rice, black beans, pico de gallo, cheese, short ribs and topped with more cheese, guacamole and green sauce then baked. It's like a giant baked burrito." Alice ordered the relleno with crab meat and Ted ordered the regular cheese relleno. "If I eat 1/3rd of this, I will explode," I said upon presentation of the panqueque. I ate a quarter before I gave up and had it wrapped for breakfast. I felt this justified sampling Alice's crab relleno - which had surprisingly large chunks of fresh crab and a piquant cream sauce with just enough bite so as not to overpower the delicate sweetness of the crab. Ted, getting a second wind and perhaps a hollow leg, powered through the relleno. "I want to get a look at those desserts," said Ted. Who was I to argue? "Wait, don't tell me. The thing I was going to order is 86'd." "Maybe. Was it the chocolate bread pudding?" We ended up going with a crêpe stuffed with condensed milk caramel and bananas topped a la mode. "Do you have any espresso?" "No thanks. Do you have Fernet?" "Fernet Branca. It's an Italian amaro popular in Argentina. In fact, the national drink of Argentina is Fernet and Coca-cola. The #1 consumer of Fernet Branca world-wide is Argentina, and Fernet has a bottling plant set up down there to keep up with the demand. The #2 consumer of Fernet in the world is the city of San Francisco." Drinks, appetizers, entrées and a split dessert between three people: about $50 per person including tip. The previous day, the afternoon of my arrival into Grass Valley, I was invited to a dinner party hosted by a long-time friend of Ted's, who we will call Alex. Alex lived in a Scandinavian-style A-frame loft (the kind typical of ski cabins all over Tahoe and other winter-sports areas in North America) that featured an open living room, lots of exposed wood paneling and the ubiquitous (and fully functional) fireplace. Wine, IPA and small plates were had along with excellent conversation. Alex had an impressive collection of old maps, some passed down from his late father, as well as a small library of books on a number of arcane subjects and artwork. Of course, the wine and cheese didn't come out of nowhere, like light from the darkness in the that most famous of Latin phrases fiat lux. "To bake an apple pie from scratch one must first invent the universe," so the saying goes. Of course, I didn't have time to invent a universe, so it is lucky that the BriarPatch Co-op was nearby so we could pick up some items for pot-luck: a loaf of bread (a pretty decent locally made sourdough), some cheeses, a beet and apple salad and a torn kale and carrot salad. The last two items come from the Briar Patch deli counter, which to my amazement featured meat products. "Look, Ted, meat in a coop! You won't see that at Rainbow." "I know man it's a bummer, I wish this place was more like Rainbow sometimes." On that we shall agree to disagree. "Alice where's the cheese section," I asked, while staring at the cheese section. The section took up barely two 72" by 36" by 19" display coolers, dwarfed by Rainbow's expansive collection. I realized that, meat or no meat, I was spoiled by living in the city. My trip to Grass Valley was bookended by those elusive and perennially disappointing East Coast specialties, the pizza and the bagel. As we have established it is possible to make proper pizza on the West Coast as evidenced by Apizza Scholls in Portland. I came to Grass Valley the way I left it, via Amtrak to Colfax. My route in: a bus from San Francisco to Emeryville, then the Capitol Corridor train to Sacramento and finally the Placer/Sierra bus route terminating in Sparks, Nevada. We arrived at Pete's Pizza in downtown Grass Valley after having been rebuffed by an unusually busy Red Frog (out in Colfax) - moments before we rolled up a pack of bikers in black and orange had rolled in (go Giants). Pete's appears to be a typical California pizzeria: salads featuring chick peas and beets, several different types of IPA and pizza suffering from a culinary clown car of toppings. In deference to Ted's deviant vegetarian ways, we ordered the vegetable pizza (which featured a few too many toppings, but not enough to mask a disappointing crust) and salad. In deference to the fact that I was paying for dinner, I got an order of wings. The wings were battered, fried then sauced - a style I have no major complaints against. Several days later it was time to head out on the second leg of my Central California adventure, descending the Sierras through the Sacramento valley and into the state's capital then out once again down CA-99 along-side I-5 toward Modesto and points south: San Joaquin Valley. Before leaving, however, we stopped in to what I swore Ted called "yummy summer time bakery," and was a little relieved to see that it was merely a bad pun and not a treacly rhyme: Summer Thyme's Bakery. Here I ordered the first of two breakfast sandwiches I ate that day: ham, egg and cheese on a jalapeño cheddar "bagel". Ted picked up a vegetable stuffed sandwich and Alice picked up an Italian canned lemon soda (her usual breakfast is a couple Fruit Roll-ups). It was a good sandwich, and the signage assures me that the "New York Bagels" are baked daily. However, what they labor to produce is merely good bread that happens to have a hole in the middle. A bagel is boiled, then baked. A bagel has a tough, almost crunchy exterior and a still steaming chewy crumb. I will make a lot of allowances for pizza (I'll get drunk and enjoy a slice of Sizzle Pie despite it's crimes against the form), but a bagel is a bagel and I have found precious few places on the West Coast that get it right. I should have gone with the croissants, which were large and dark golden brown... speaking of food artifacts from the Islamic incursion into Europe. That's another story. I was dropped off at Colfax an hour early because Ted and Alice were going to turn around on CA-49 to head up to the Sierra Valley Hot Springs with some friends. I would have headed up there but scheduling restrictions dictated that I make my way south to meet up with my blog partner in crime, 99% Bittersweet. It had started raining the previous day - soaking central California's water starved soil with not enough water, sprinkling the Sierras with a dusting of snow that would evaporate away days later. 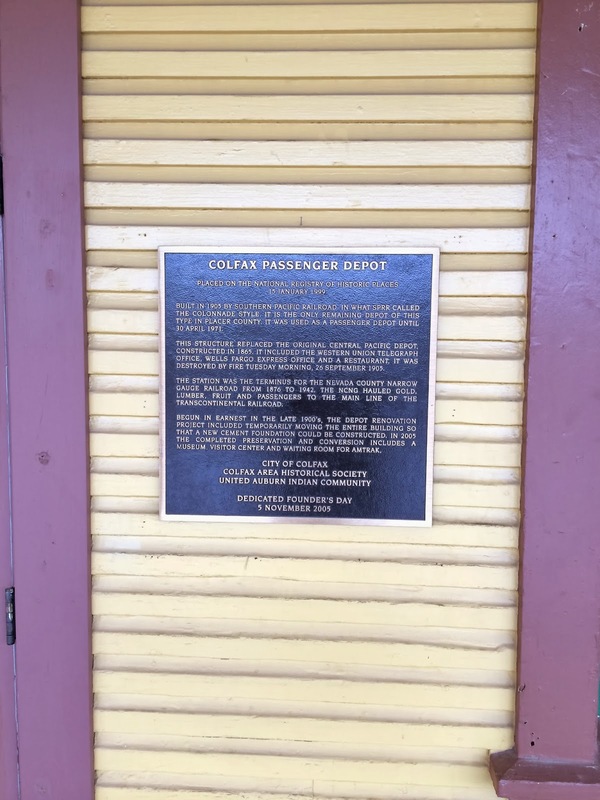 Colfax's train station is, like a majority of waypoints along Amtrak, an unattended station. The Colfax station houses the Chamber of Commerce and a rail museum, neither of which I have ever seen open (apparently the latter opens on the weekends during the day). It was a Thursday and it was raining and chilly. Meanwhile in Ohio, the temperature had dropped to single digits and the east side of Cleveland was being pelted with a whiteout layer of fresh snowfall. All things considered, I was the lucky one. Still, 10AM came and went and there was no sign of my bus. 10:10. 10:15. 10:30 and I put a call into 1-800-USA-RAIL, Amtrak's customer service, to talk to "Julie", Amtrak's noxious automated customer service robot. When I finally talked to a human being they reported that the bus was running 15 minutes late, 35 minutes after I was supposed to be picked up. I pointed this out and the agent explained to me that Amtrak Operations don't track the busses, many of which are run by third party liveries (many of whom also operate the much maligned private shuttles for Bay Area tech companies). "It's snowing in the Sierras so the busses are on chain restriction, that's all I can tell you, I'm very sorry." All I could do was wait in the cold and rain until my bus finally made it out of Truckee and down the side of the mountain, which took another 35 minutes all told. Waiting for the California Zephyr train would have been pointless - it was at least an hour behind it's normal 11:45AM schedule. At 11:15 we rolled out of Colfax, the driver apologizing for the delay. I put on my headphones, plugged my phone into my laptop to drain its battery for a while and pulled over my hoodie as I watched the countryside, lush and green from recent rain, pass by. I was so sure what I needed was more I tried to shoot out the sun." Country turns to city and I'm in Sacramento. Breakfast sandwich number two. "Okay folks, we're going to be running a bus shuttle to Stockton where you'll be picking up another bus instead of getting on the 716 train due to track work. The shuttle will take you to Modesto where you'll get on the 716 the rest of the way to Bakersfield." Southbound on CA99. Between Galt and Lodi an expansive cemetery with small white military gravestones in neat rows looked like rows of soybeans planted in the ground. We sped past Lodi (Linds) Airport where a silver DC-3 exclaimed "Eat, Fly, Skydive!" Stockton resembled a California version of the worst parts of the near east side of Cleveland, Ohio: a lot of abandoned industry, chain link fences with razor wire, run down and ramshackle housing and concrete. There we waited for the northern leg of the SB716 to terminate, and we would all be bussed on a bus bridge to Modesto. Modesto Amtrak is situated next to a cherry orchard. A few tourists ventured out to take pictures of the trees in bloom. NB715 was running late, the train from Bakersfield. It would terminate in Modesto, become the SB716 and turn around. The 715 pulled in at 17:00, almost two hours late, and 8 hours after my journey began. Finally I was aboard an actual train and I had only one more stop before I reached my final destination of Turlock/Denair Station.